Kasson Minnesota insulation & contractor services. Putting Kasson homeowners first for over 30 years. Our experienced insulation experts can help you improve the energy efficiency performance of your home. There are countless ways to improve your home's energy efficiency level with new attic insulation or injection foam. Ask about our current insulation specials and offers! Finding an insulation contractor you can trust in Kasson can be difficult and risky. Trusting any contractor with your home should only happen after you've done plenty of research and background checks into potential companies. Ryan's is a licensed and insured insulation contractor. We sell and install many different kinds of insulation, including attic insulation, injection foam, blown-in insulation and loosefill. We're also one of the few licensed contractors to have BPI Certified installers on every insulation job we're hired for. Upgrading your home's insulation is one of the easiest ways to improve your home's energy efficiency level. Newly installed insulation can often pay for itself in a very short timespan. Energy costs in Kasson and southern Minnesota are only expected to increase over the next 5 years. Upgrading your insulation is the safest way to make sure that your wallet wont feel the sting of these expected price increases. So feel comfortable in your home by hiring Kasson's top rated insulation contractor. Ice dams can be a destructive force, that damages your roof and home. 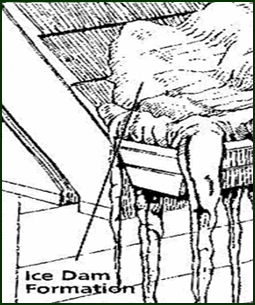 Often ice dam formations are a sign that the internal attic temperature and ventilation are not at the correct R-Value levels. Many homeowners eliminate their ice dam problems by upgrading their insulation and having their roofs ventilation checked. Call Kasson's ice dam removal team today.